If you like your holidays packed with incredible activities, yet so chilled out you will barely notice the minutes tick by, then Wellington is the place for you. Our capital has a big reputation as one of the coolest cities in the world, and every word is true. Pay Wellington a visit to see just how magical it is, offering the best of authentic Kiwi landscapes and modern attractions in one place. Our flights to Wellington depart from London Heathrow, and we fly to the capital every day, so whenever you want to explore one of the greatest spots in our beautiful country, we’ll be ready for you. We offer flights that let you see the world en route, working in partnership with leading airlines from around the world to bring you journeys that are a pleasure, rather than a chore. Our stopovers are in a variety of exciting cities, giving you the perfect chance to explore before making your way to Wellington. If you would like some time to explore your surroundings en route then why not try a multistop booking? Giving you the opportunity to customise your travel route to suit your curiosities, a multistop booking lets you make the most of every second of your journey. The likes of Hong Kong, Shanghai, and Singapore aren’t quite on your doorstep in the UK, so take advantage of being in the area and go out seeing the sights! This option is typically no more or less expensive than a direct flight, so the only thing you’ll be spending is time. You can select up to five different destinations, so have a look at which combinations are on offer using our international multistop booking engine. No two passengers want the same things from their flights, so we offer different service classes on our flights to suit any and all of the people who fly with us. Entertainment galore, total comfort, delicious food, and quality service are the minimum that passengers can expect from our flights. On top of these, flying in either Premium Economy or Business Premier offer their own definitions of ‘perfection’ for anyone looking for something a little bit extra. Flying in Economy, you can benefit from an optional Skycouch upgrade to give you more space and enhanced relaxation, with an extended seat which has an elevated footrest. It’s a great option for families with little ones who want to cuddle up during the flight, or couples looking for a bit more space to unwind. Comfort is already guaranteed on our flights, but a Skycouch upgrade takes it to a whole new level. As the gateway between the North and South Islands, Wellington is the perfect spot for a staycation. This beautiful city offers stunning beachside views looking out over the Cook Strait, while the air is electric with the inner-city vibe. Let us take you straight to the heart of the country, flying quickly, affordably, and in total style. Wellington is a city with a strong heartbeat. The streets are alive with laughter, culture, and warmth, while the surrounding areas offer exciting experiences for anyone willing to go exploring. This sophisticated city has a vibrant cafe society feel, making it the perfect place to indulge in a flat white, which was supposedly created here, while you sit and watch the world at play. For anyone with a penchant for adventures in the wild outdoors, Makara Peak has some of the most thrilling and visually enchanting mountain bike tracks in the world. 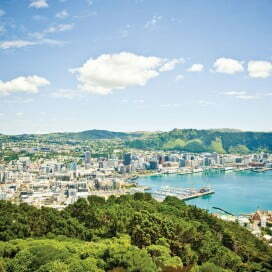 A ride around here will get your heart racing while you bask in natural beauty that is 100% Kiwi. The nearby Kapiti Island houses a number of the endangered bird species native to New Zealand, so animal-lovers can enjoy a really unique day treat here. As well as natural charm, the man-made attractions in Wellington are just as fabulous. There are plenty of theatres and galleries here, as well as the world-famous WETA Workshop Tour. This is the creative workshop and special effects company behind Peter Jackson’s Lord of the Rings trilogy, which helped put the dramatic, natural scenery of New Zealand well and truly on the map. It’s an immersive and eye-opening cinema experience, especially if you have already visited Hobbiton! Once you’ve ticked off the sights of the city, it’s time to enjoy the tastes, and try out some of Wellington’s gourmet delights. This city knows how to create mouth-watering food combinations, and is known for having the best culinary offering in the country. Whether you pick something up from the Sunday farmer’s market, or try some fresh seafood courtesy of the harbour, you are guaranteed to love every bite. The perfect way to wrap it all up? Make your way to the top of Mount Victoria and wrap up in blankets while the sun sets. It has never looked more majestic. Wellington airport image courtesy of Positively Wellington Tourism; Wellington aerial shot image courtesy of WellingtonNZ. ; Oriental Bay beach image courtesy of Positively Wellington Tourism.